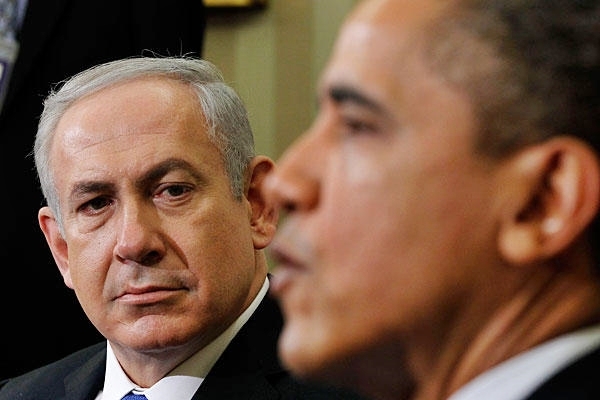 Washington, D.C. — October 2, 2014 … US President Barack Obama criticized Israel Prime Minister Netanyahu at the White House yesterday warning him not to proceed on “proposed settlements in a disputed part of east Jerusalem.” The White House then issued a press statement on “Israel settlements” hours after Obama met with Netanyahu. “This isn’t a settlement. These are neighborhoods in Jerusalem, the capital of Israel,” said Netanyahu. The Union of Orthodox Jewish Congregations of America, the largest Orthodox Jewish umbrella organization in the US, strongly rejected statements made by White House Press Secretary Josh Earnest and State Department Spokesperson Jen Psaki with regard to Israeli plans for housing construction in the Jerusalem neighborhood of Givat HaMatos and Israeli Jews purchasing houses in the neighborhood of Silwan. “We reject yesterday’s harsh statements by the Obama Administration. First, they suggest that the onus for the peace process impasse is upon Israel, when in fact it is decades of Palestinian and Arab rejectionism and incitement (such as that voiced by Palestinian President Abbas at the UN General Assembly last week) that “poisons the atmosphere” for peace. Israel has demonstrated its interest in peace, not merely through words but through deeds, time and again. Second, suggesting that Jews residing in neighborhoods of Jerusalem—the historic capital of Israel and the Jewish people—is “provocative” is offensive. It is also fundamentally at odds with the notion that differences over Jerusalem are to be resolved in negotiations. Finally, the implied threat that Jewish residences in Jerusalem will “distance Israel from even its closest ally”—i.e., the United States—is a resort to rhetoric which is entirely unacceptable. Please do not allow the actions of our president to reflect poorly upon the peoples of the United States. His administration has made one mistake after another and even the most shortsighted of US citizens have begun to realize that his agenda is not the platform he ran upon when seeking election. The American people, minus an uneducated insignificant but vocal minority, view Israel to be the one source of sanity in the region. Your policies and forbearance in the face of continual assaults by a people with the mindset 15th century savages is something that is looked at with admiration. Indeed, were we surrounded by enemies on all sides, each of which was calling for the utter destruction every day of every year, you would see a rapid increase in the bellicosity of the American people. So much so that many would take the situation into their own hands and launch attacks on such enemies. Yet the even hand you present to your foes illuminates to the world the wisdom of your government. in other words, please continue not only with your current methodologies but please be patient with the United States until another 2 years have passed and we (almost certainly) have a more capable leader in place that wants security and success for not only our country but yours. Please excuse my president. He is an Islam and is not responsible for his lack of knowledge that Jerusalem is the historic capital of Israel and the Jewish people. Dear Mr. Netanyahu. Many Americans are in support of ISRAEL, I am one of them. Please do not follow this President opinion or direct, He cannot lead in America because not only He doesn’t know how, not experience in Leadership and in top of everything He is a Muslin and not a Christian or a Jew. He is destroying America and the reputation of our FREEDOM around the World. May the LORD guide you in your Leadership to protect ISRAEL and the PEOPLE. God Bless Mr. Netanyahu. Our president is sub moronic at best in just about every nuance of his responsibilities as commander in chief. In the words of your wonderful brother, Yoni, of blessed memory, “it will be ok”. stooge who is too cowardly reveal his name. The overwhelming majority of us recognize who is the chicken#@%$ in the war on terror. In my opinion, you have become the leader of the Free World by default. We trust you and pray for you. Thank you for standing up for liberty and justice when President Pantywaist will not.